With the completion of the roof, the exterior framing is completed by the addition of the porch roof, end-caps to the roofing and other basic framing items. As you can see, the house now has form and the rooms are laid out so you can walk between them. Now you finally get a good feel for the size and layout of the actual house. The crew will go back and inspect every wall and check them for straightness and levelness. Uneven boards will be made even and the construction crew will double check their carpentry. Buying an already finished house and buying a new home, which is still unfinished, both have their own advantages and disadvantages. As a homeowner, you would want to own a home which you can rightfully call an investment-an investment that will last for decades and decades of use and still keep its base intact. If this is your philosophy, then you would want to know all about the house interior, exterior, and everything in between. That is where the major difference between buying a pre-furnished house from a soon-to-be-finished one lies: with the latter, you get to see each step of the building process. It is important that you yourself are equipped with the right knowledge on what is good and what is bad for your homes structure. From the smallest details up to the glaring ones, you should be able to demonstrate good judgment over the work of the men you chose to build your house for you. 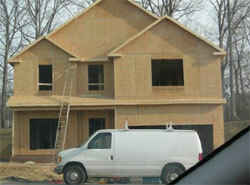 If you only know a little about home construction, how will you be able to safeguard yourself? This is where homebuilders or inspectors come into play. Choosing a competent home inspector can save you from lots of stress and expensive repair jobs in the future. Make sure the framing is well connected and sturdily built A properly built frame ensures the houses overall reliability. The framing of the house serves as the skeletal foundation of any structure, it is important that all sides and joints are linked firmly. Check if the top and bottom headers are fastened and fully supported by braces. Check for bad lumber that sometimes is twisted or split as these will create a host of problems in the future. Wood materials with slight imperfections can still be used. They can be cropped and made into braces or used as cripple studs. Check the thickness of the wood used for framing as well. Usually, a 2"x6" stock is a better sound insulator and has more room for pipes and ducts. Are electrical wirings installed in the right places and installed properly? How about the placements of receptacles, wall switches, and outlets? Each room must have sufficient and properly positioned switches and outlets to be effective. Make sure there is cable, phone and internet in every room applicable. Plumbing is an area of your home system that you must pay extra attention to. As one of the most heavily used parts of the home, making sure that plumbing lines are damage-free and properly located will save you from developing costly dilemmas in the future. Check to see whether an adequate supply of ductwork is installed in your home. Make sure there are sufficient air return intake spots available. Avoid future heating and air conditioning problems later by ensuring there are no damages in the ductwork. Do not be afraid to ask questions of your builder and all the subcontractors. They will be able to tell just by a quick walkthrough which parts of the home are correct, and those that will cause you headaches down the road, so be sure to take his or her observations to heart.